HDPE T-flex is fast replacing conventional piping systems for water supply and distribution. T-flex pipe systems are extensively used for new as well as replacement piping works throughout the world. 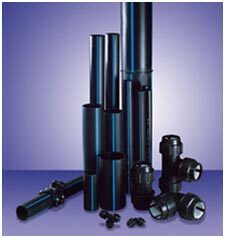 T-flex pipes for water are black in colour with a smooth internal surface. The inherent characteristics of PE such as corrosion resistance, availability in long lengths, ease of installation and leak free joints make T-flex pipe systems a preferred choice. T-flex pipes are manufactured in nominal outside diameter of size 20,25,32,40,50,63,75,90,110,125,160,180,200, 250, 280, 315, 355, 400, 450, 500, 560 and 630mm. Coils up to 50m and 100m lengths are available for sizes up to 90 mm. T-flex pipes are available in straight lengths of 6m and 12m for sizes up to 630mm. T-flex pipes for potable water application are manufactured according to latest International Standard ISO 4427-2(E): 2007, PE pipes for Water Supply specification, DIN 8074/8075 and PS – 3580: 1997.